Below are graphs to demonstrate the effectiveness of the scholarship link building campaign. The data is taken from Google Analytics, Ahrefs referring domains, and Ahrefs Organic Traffic and Organic Keywords. 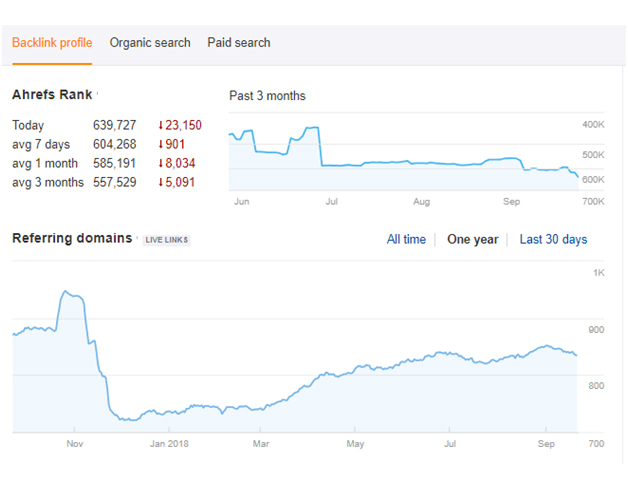 The graphs show the organic traffic growth throughout the campaign and its correlation with the growth of referring domains. Strategy: Client faced a challenge of earning links that featured competitors. After reviewing their on-site content for top keywords, Sure Oak determined which pages would be best for link building. Through traditional outreach, Sure Oak built links to identified pages. Sure Oak also identified the need for high authority .EDU backlinks to help boost DA, traffic, and referring domains to Client. Results: A total of 36 valuable .EDU backlinks have been created. In addition to the .EDU backlinks, 53 contextually relevant backlinks were created for the targeted pages. 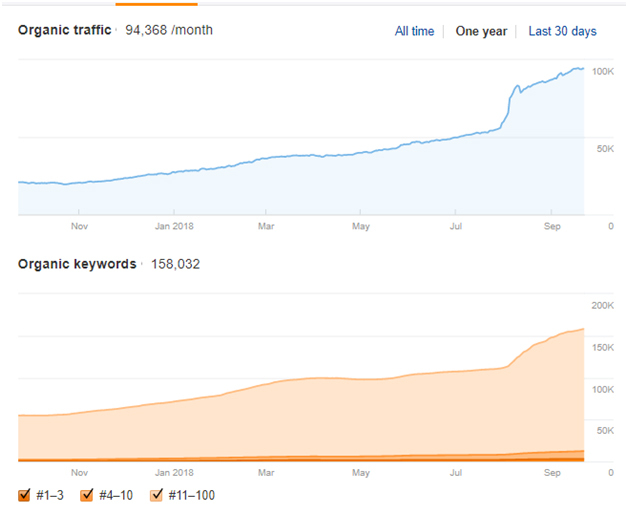 Total valuable backlinks pointing to the website increased by 51% from March 2018 to September 2018. 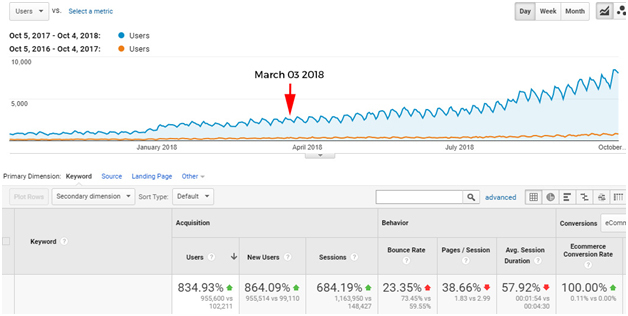 Organic Traffic Growth of 161% from March 2018 to September 2018. The number of visitors increased from 66,310 to 173,346 per month. 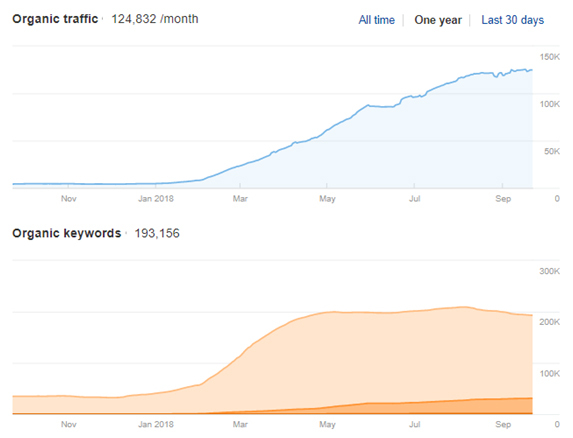 A Year on Year comparison shows an 834.93% increase in traffic from 102,111 to 955,600. Strategy: Client partnered with Sure Oak to earn additional links to their site. After reviewing Client’ site and needs, Sure Oak determined that a scholarship link building campaign would help to increase Client’ traffic and referring domains. Execution: Began a scholarship link building program to acquire high-authority, high-value backlinks to the website. Results: A total of 67 valuable .EDU backlinks have been created. 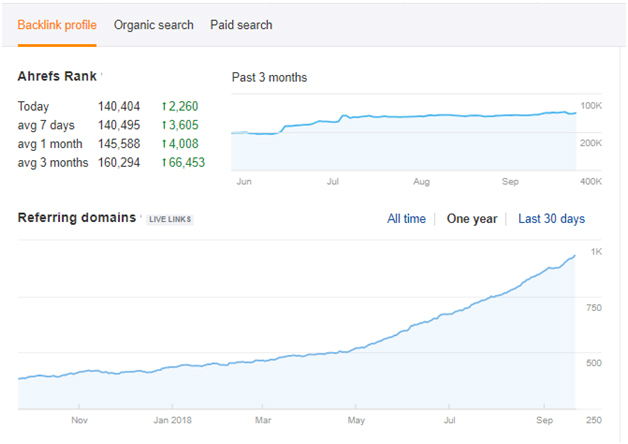 Total valuable backlinks pointing to the website increased by 70% from January 2018 to September 2018. There was also Organic Traffic growth of 420%. The number of Client visitors increased from 29,547 to 153,346 per month. There was also Organic Traffic growth of 2020%. The number of Client visitors increased from 48,607 to 1,030,560 per month. Strategy: Client approached Sure Oak looking for a unique link building strategy to increase referring domains and traffic. Sure Oak identified the need for high authority .EDU backlinks to help boost DA, traffic, and referring domains to Client. With success of the scholarship link building campaign, Sure Oak determined that traditional link building should begin to diversify Client’s referring domains. After reviewing their competitors’ link profiles and on-site content for top keywords, Sure Oak determined which pages would be best for link building. Through traditional outreach, Sure Oak built links to identified pages. Execution: Began a scholarship .EDU link building program to acquire high-authority, high-value backlinks to the website. Conducted competitor analysis to gain insight into competing link profiles. Reviewed content for link-worthy assets and determined which pages would be most successful. Traditional outreach was performed to earn links. Results: A total of 85 valuable .EDU backlinks have been created. 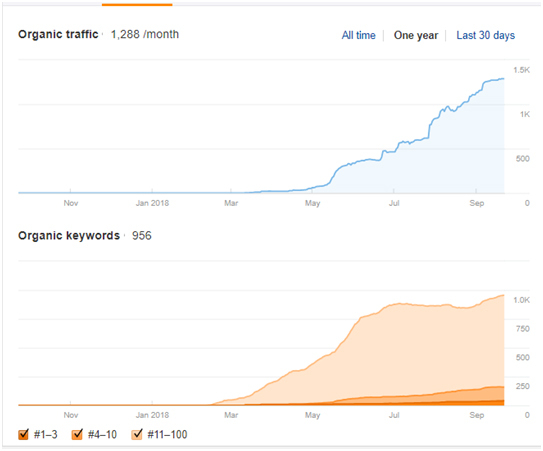 Since beginning additional link building in July 2018, 13 content related links have been created. 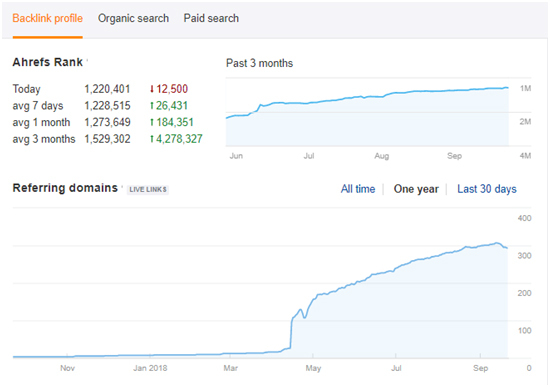 Total valuable backlinks pointing to the website increased by 12% from January 2018 to September 2018. 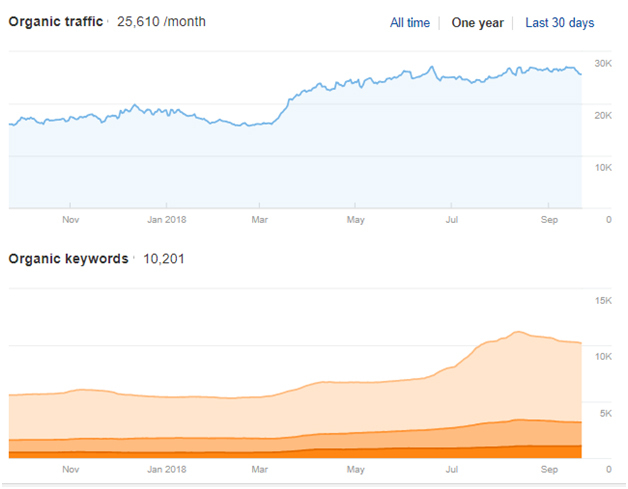 Organic Traffic growth of 47%. 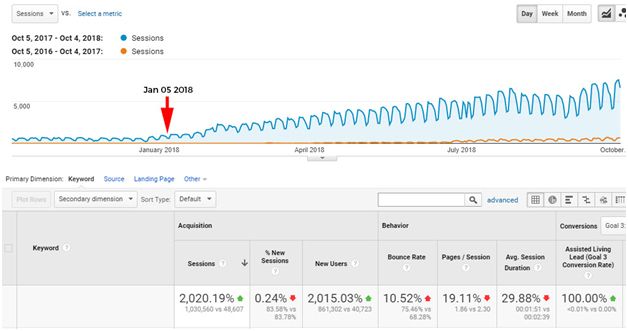 The number of Client visitors increased from 17,000 to 25,000 per month. 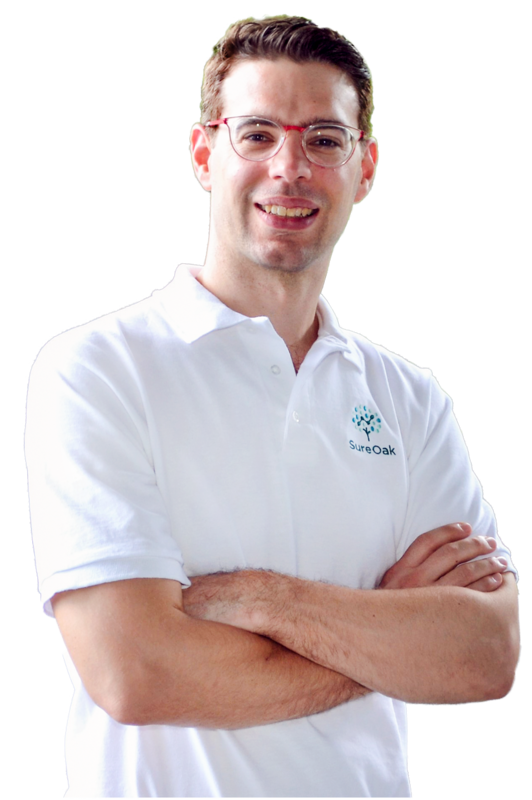 Strategy: Client partnered with Sure Oak to improve their off-page SEO. After reviewing Client’s site and needs, Sure Oak determined that a scholarship link building campaign would help to increase Client’s domain authority, traffic and referring domains. Results: A total of 72 valuable .EDU backlinks have been created. Total valuable referring domains pointing to the website increased by 2,500% from March 2018 to September 2018. There was also Organic Traffic growth of 12,700%. 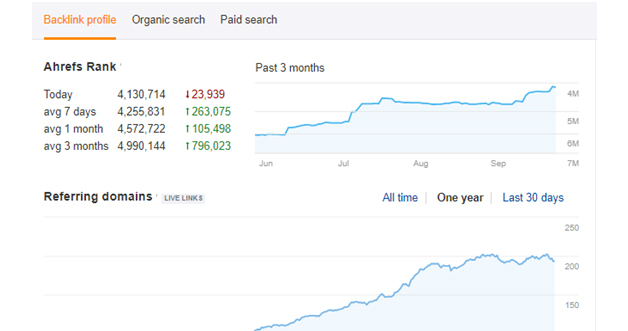 Organic Traffic growth increased from 10 visits per month to 1,288 per month.